Late Tuesday night, and in the days afterward, friends and loved ones reached out wth emails, texts, and Facebook messages. They apologized that the election didn’t go my way after the work I put into the campaign, they assured me that gay rights had already come so far that the progress couldn’t be undone, they asserted that Jews have enough power in America that our safety won’t be at risk. I’m grateful for every one of those messages, but they also felt strange. This isn’t my loss — it’s all of ours. This isn’t about the threat that Trump poses to any one group of people — it’s about the threat he poses to everyone. Most importantly, it’s about the threat he poses to America. I’m afraid of all of it. But alongside my fear is an even greater resolve. We will keep fighting. Building a mental picture of my hierarchy of fears has been helpful, because as we plan our response to the threats Trump poses we must know clearly what we’re up against and decide explicitly where to focus our energies. 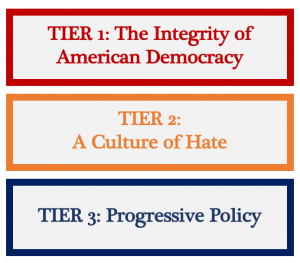 Under any other Republican administration, the bottom tier would comprise my complete concern set. Healthcare access, protection and expansion of workers’ rights, minimum wage increases, smart financial regulation, women’s reproductive rights, LGBT rights, humane immigration policy, work to stop climate change, generous funding for public education, debt-free college — all of our aspirations are under siege and many of our achievements are already as good as undone. The list of anti-Muslim, anti-immigrant, racist, misogynist, and anti-Semitic attacks is growing longer by the day. This hate it not new in America, but it has been empowered and emboldened by the election of Trump. The selection of Steve Bannon as Chief Strategist is the latest confirmation that white nationalism will have the closest possible proximity to power in the next four years — it’s no wonder that the KKK is holding a victory march. The continued flourishing of this atmosphere of hate is an even bigger concern than the doing or undoing of broader progressive policies. The keeping of an enemies list, opacity of financial ties to foreign governments, refusal to grant access to critical media outlets, threats of retribution against opposition political figures — these are the hallmarks of authoritarianism, and Trump is already exhibiting them in spades. Will he abuse executive power? Pack courts? Use the IRS and DOJ as agents of retribution? Will American Democracy as we know it survive until January 2021? This is no longer a hypothetical question. The threat is overwhelming, but to understand it is to be able to attack it head on. Do we focus our energies purely on the top tier, and how? More marching? Dedicating ourselves to Democratic pick-ups in congressional and local legislative races? We should overwhelmingly fund the ACLU and hold the feet of the media to the fire so that they do not normalize Trump’s authoritarian behavior — but can we do so systematically? How can the culture of hate be stifled before it gets further out of control? Yes, we can wear safety pins and add them to our Twitter handles; yes, we can donate to the ADL and HRC and SPLC — but what else is to be done to keep us shocked and keep our vulnerable populations safe? Finally, how can we best preserve the Obama era legacy of progressive progress? How can we protect DREAMers and trans people and students with debt and families with precarious healthcare? Interest groups and policymakers can fight on this front — but they will be up against unprecedented threats, threats that target much more than the Democratic platform. I’ve seen an outpouring of great ideas and unbounded energy from friends, loved ones, colleagues, and acquaintances. Now we must catalyze these ideas and energy into a clear action plan and set of institutions to do the work of ensuring our greatest fears aren’t realized.